White Wolf : This Baby Chick and Kitten Cuddling May be the Cutest Thing You’ll Ever See! 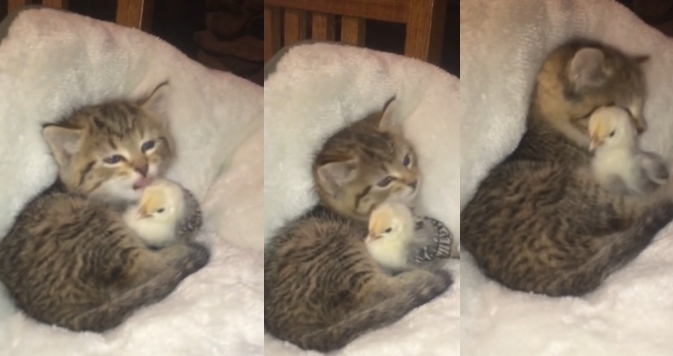 This Baby Chick and Kitten Cuddling May be the Cutest Thing You’ll Ever See! It’s hard not to “squee” when faced with something as cute as the sight of these two babies being best friends. While most people might think that cats and any kind of bird don’t not get along, the kitten and chick in this video live that stereotype down – and they’re not the only ones. Many animals that most people might think are indifferent to each other at best are the epitome of true friendship. We’ve seen cats and dogs, birds and cats, and a wide variety of other animal pairings. The baby bird in this video is getting the best bath ever from his kitten friend. Cats, as it turns out, give great baths to fluffy critters like this chick. Papillae, the tiny barbs that cover a cat’s tongue and make it kind of scratchy when they give you a kiss, are necessary for the cat to collect, dirt, dust, particles and shed fur from their coat, and this cat is using hers to make sure her birdy bud is completely clean. What a great friend to have! Responses to "This Baby Chick and Kitten Cuddling May be the Cutest Thing You’ll Ever See!"